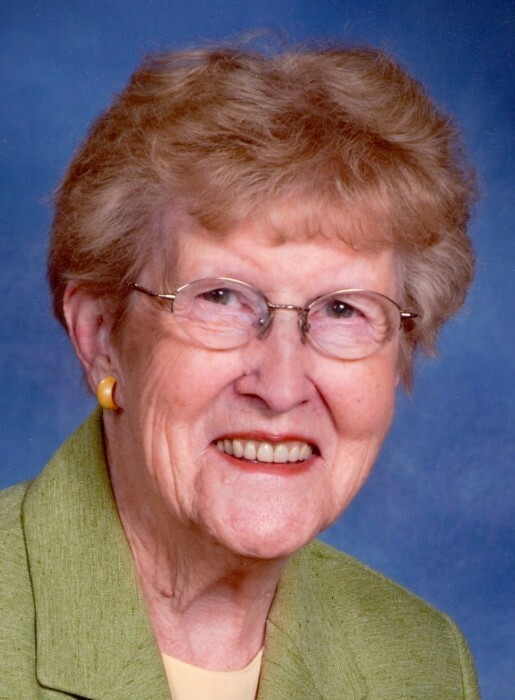 June Marjorie Ensrud, age 89, resident of Pekin, ND passed away Sunday, April 14, 2019 at the Nelson County Health System Care Center in McVille, ND. June was born June 14, 1929 in McVille, ND the daughter of Peder and Gida (Brekken) Ronningen. She married Myron Ensrud on June 20, 1949 at Devils Lake, ND. After their marriage they lived and farmed in rural Pekin, ND. Myron passed away on June 25, 1995. June was a member of the Pekin Lutheran and Sheyenne Lutheran Churches, where she served in both WELCA groups. She was also active in the Homemakers and Red Hat Society. Her first job was at the Court House in Devils Lake. She then would take the train to Pekin with her best friend Carol where they would stay at June's Aunty Theas's house. This is where she met Myron, and fell in love with her Pekin boy. After they retired from farming, June and Mike loved to travel. From Norway to Hawaii, many memories were made. She loved her farm life and her yard and flowers. She had a special place in her heart for her dogs! Mike always said "If he could come back as one of June's dogs, he would have it made! June was as selfless as they come, always willing to help with anything. She loved her children, and even more so, her grandchildren. She spent many days playing and laughing with them. She had a heart of Gold. Surviving members of the family include 2 sons Kent (Mary Ann) Ensrud of Pekin, ND and Steven Ensrud of McVille, ND, daughter Linda (Jeff) Luehring of Tolna, ND, six grandchildren Jason (Kylie) Ensrud, Jeremy (Pebbles) Ensrud, Meghan Ensrud, Justin (Anna) Luehring, Jennifer (Bryant) Huso and Joshua (Kayla Wangler) Luehring, 10 great grandchildren Grace, Kellen, Magnus, Benjamin, Sawyer, Lydia, Josie, Colt, Remie and Zeb. June was preceded in death by her parents, husband, an infant son, and a brother John. Funeral services for June will be Wednesday, April 17, 2019 at 3:00 p.m. in Sheyenne Lutheran Church, rural Pekin ND. Visitation will be one hour prior to services in the church. Interment will be at a later date in the Sheyenne Church Cemetery.